This is part 3 of the “Let it breathe” series. For proper context, you might want to check out Part1 and Part2. 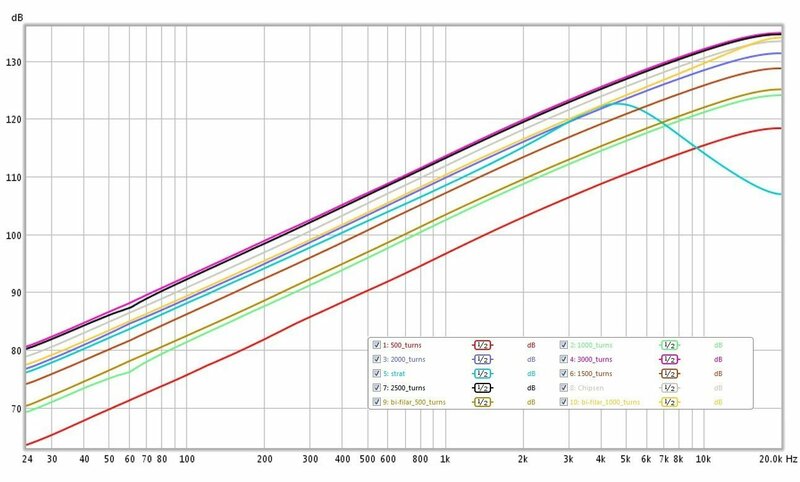 This third and last part of the series concludes with actual frequency response measurements for various coil configurations of the Hexaphonic Pickup Project and with the Fender Stratocaster middle pickup as benchmark to compare against. In addition to standard windings with 500, 1000, 1500, 2000, 2500 and 3000 turns AWG 42, we also tested bifilar windings (see Alternative Ideas) with 500 and 1000 turns AWG 42. Like before, the low-power LME49726 OP Amp is used in the differential preamp stage with a gain of 5. There’s also an additional test labeled “Chipsen” specifically for the initial sample of the prototype coil we just got from a coil manufacturer (specializing on inductors) and intended for the final production. The pre-production prototype is a 2000 turns AWG 42 coil, standard winding. We’ll have more about the evolution of the coil and bobbin in succeeding updates. Click graph to zoom in on the details. The measurements were done using a low impedance (56 Ω) coil driven by the headphone output of the computer audio interface. A sine sweep from 20Hz to 20khz is sent through the driver coil which is positioned 2 mm above the pickup coil. The method utilized is not perfect. First, the driver coil itself can impart its own frequency response curve that can potentially skew the results. However, it is assumed that its lower inductance will give it a wider range than the pickup coil. Moreover, the ideal setup would require an Integrator before the amplifier driving the output coil (to produce an output voltage inversely proportional to frequency). This is needed to counteract the effect of the pickup coil which responds to string velocity (the output voltage is proportional to the rate of change of the string’s position), thus behaving more like a Differentiator. Had there been an Integrator, the graphs above would be flat, falling rapidly at the cutoff point. Yet, for our purpose of knowing where the cutoff point starts and the overall frequency response shape, the tests are good enough. As expected, the Stratocaster pickup has a resonant frequency somewhere in the 4-5kHz range and has the characteristic Q hump. The plain wound coils all have relatively flat response with a mild down slope towards the high end of the spectrum. The 1000 turns bifilar coil has a noticeably higher Q factor near 20kHz, again as expected since bifilar coils have higher self capacitance. The measurements indicate that we’ve already reached the optimum wide-band frequency response with a cutoff point well beyond 20kHz. Prev post Singles or Doubles?